Nearly a quarter (24 per cent) of drivers have never bothered to check their tyre tread depth - while 45 per cent admit to not checking it within the last six months. 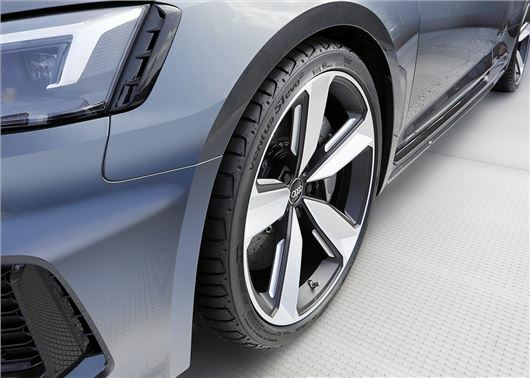 That's according to research released today by Hankook Tyres, which has also found that four out of five drivers don't know the legal minimum depth of tyre tread. At the start of October's Tyre Safety Month, motorists are being warned that driving with tyre tread below 1.6mm could land them with a fine of up to £2500 and three penalty points per tyre. Worn tyres are also dangerous, increasing stopping distances and the risk of losing grip in wet weather conditions. Hankook's survey reveals that younger drivers are less likely to know the 20p test for checking car tyres. This requires placing a 20p coin in the main tread channels at various points of the tyre. If you can see any part of the outer band of the coin face, it means the tyre tread is too shallow and is likely to be illegal. Worryingly, only 47 per cent of drivers say they would replace their tyres as soon as they reach the minimum legal tread depth - while 14 per cent would only consider buying new tyres if they'd had a puncture or their tyre had become flat. Drivers are also unaware of the meaning of the code on the side of their tyres which reveals the size of the tyre, while nearly half (45 per cent) of young drivers would consider purchasing part-worn tyres despite not knowing their history or how safe they are compared to new tyres. Shocking. Another example that proves the roads are full of idiots. I don't need to check tread depth on my car tyres, bought it new Feb 2011, original tyres just checked at service shows 7mm on all tyres at 7.5 years old. If it wasn't for tyre walls cracking the original tyres would last life of the car, it's only done 5,300 miles. I just check for anything unusual and check pressures.MOT tester says he will tell me when I need a new set and I will replace them all. I don't drive on motorways just to local town each week, under 1,000 miles a year. I bought new as I got it cheaper than used one. Just mention that tyres deteriorate with age, even stored in a warehouse. Manufacturers warranty expires at five years. Buying used tyres is false economy as best part of deals in the first half of the tread, budget tyres better buy than part worn. Also part worn could have been badly repaired or suffered in an accident so could be illegal. I would prefer lots of tread on a budget tyre to a worn premium tyre, for my use I throw them away with 6mm tread left due to very light use, by the time they get down to 6mm the walls are starting to crack and perish so have to change and that is with premium brand tyres that cost twice the price of budget tyres, with new budget tyres I know how they have been used unlike used premium tyres. The ONLY contact between you and the road is that patch of rubber under each tyre. Why on earth would drivers compromise their safety and those of their passengers by not ensuring that that patch of rubber is as good as poss? ?